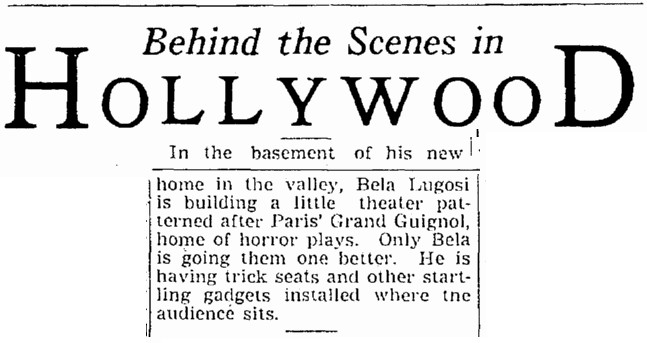 HOLLYWOOD, Dec. 7.—Hollywood’s first “horror theater,” patterned after the Grand Guignol of Paris, and to be known as Petite Guignol, will be construed by Bela Lugosi in the basement of the new home he is to build in the San Fernando valley. Lugosi, who created the role of Count Dracula on the New York stage and later in pictures, has long desired to organize and direct a playhouse where short sketches dealing with the occult, magic and metaphysics could be presented. Under the plans outlined by Lugosi the playhouse will be decorated in weird designs dealing with the occult and the entrance will be through an underground tunnel suggestive of the catacombs. Original plans will be produced in the theater and young actors and actresses striving for a foothold in the theater and in pictures will be given an opportunity to display their talents. There will be no salaries for the players, director or others connected with the venture, and admission money will be used for actual expenses. Lugosi plans to invite other players interested in the venture to act as a board of directors on the project, and Dr. Manley P. Hall, noted lecturer and writer, already is working on playlets for the group.